The “Tank Man,” otherwise known as as “Unknown Rebel,” single-handedly on this date in 1989 brought to a halt a line of tanks the day after the deadly forcible removal of student protesters from Beijing’s Tiananmen Square. Given that these soldiers had likely assisted in the mass murder of as many as thousands of young peaceful protesters, the stubborn bravery of this still unidentified man is inspiring. The Chinese do not allow access to this clip on Google. Virtually no one under the age of thirty even knows about it. This entry was posted in Anniversaries, History, Ideology, Politics on June 5, 2011 by Michael Happy. Today is Arnold Toynbee‘s birthday (1889-1975). This entry was posted in Birthdays, History, Myth on April 14, 2011 by Michael Happy. 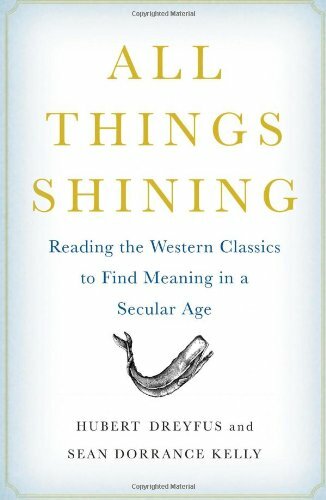 In the current issue of the New York Review of Books, Garry Wills reviews All Things Shining: Reading the Western Classics to Find Meaning in a Secular Age by Hubert Dreyfus and Sean Dorrance Kelly, who, according to Wills, recycle once again the notion that the Middle Ages presented a uniquely unified culture free of the taint of modernism and post-modernism. This book, which was featured on the front page of The New York Times Book Review, comes recommended by some famous Big Thinkers. It is written by well-regarded professors (one of them the chairman of the Harvard philosophy department). This made me rub my eyes with astonishment as I read the book itself, so inept and shallow is it. The authors set about to solve the problems of a modern secular culture. The greatest problem, as they see it, is a certain anxiety of choosing. In the Middle Ages, everyone shared the same frame of values. One could offend against that frame by sinning, but the sins were clear, their place in the overall scheme of things ratified by consensus. Now that we do not share such a frame of reference, each person must forge his or her own view of the universe in order to make choices that accord with it. But few people have the will or ability to think the universe through from scratch. Everything old is new again. Frye called this the “butterslide” theory of history, sometimes rendered as “the Great Western Butterslide,” whose roots lay in an idealized conception of the Middle Ages. Cayley: We stand at what sometimes seems to be the end of a tradition. . . . At one time Spengler was important to you. Later on you satirized him and made jokes about the Great Western Butterslide. Do you accept the idea of decline in Spengler, and do you wonder now what’s next? This entry was posted in Frye and Contemporary Scholarship, History on March 24, 2011 by Michael Happy. Today is Ovid‘s birthday (43 BC – 17 AD). This entry was posted in Anniversaries, History, Myth on March 20, 2011 by Michael Happy. On this date in 49 BC, returning general Julius Caesar crossed the Rubicon into Rome with his army, signalling the start of civil war. This entry was posted in Anniversaries, History, Society on January 10, 2011 by Michael Happy.